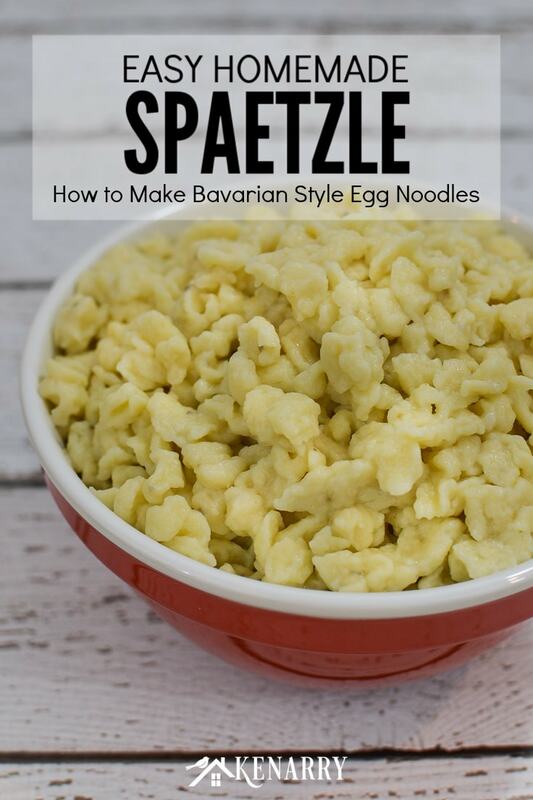 Learn how to make traditional Bavarian style German egg noodles with this easy spaetzle recipe. See step-by-step how to make delicious homemade dumplings. Making your own German egg noodles or spaetzle is easier than you think. 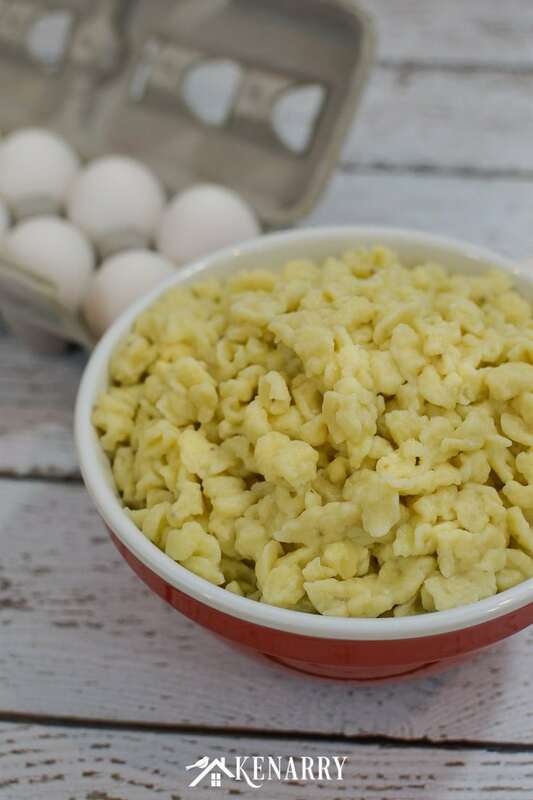 With just a few simple ingredients and this easy spaetzle recipe, you can make homemade dumplings. 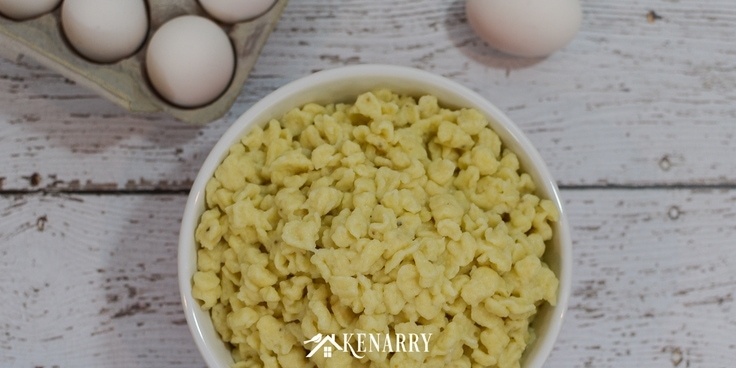 Spaetzle is great to use in place of pasta or potatoes in your favorite recipes or to serve as a side dish on its own. Ever since I was a little girl, my father has made the world’s best homemade chicken soup. It is the perfect comfort food in the middle of winter or when you’re feeling sick. When I became an adult, there were two recipes from my childhood that I knew I needed to learn to make — my mom’s homemade meatballs and my dad’s chicken soup. My dad has always claimed you can go to just about any country in the world and find some variation of chicken soup. They all include chicken of course, along with broth, some veggies and noodles. What makes my dad’s soup so special and different is that he typically makes homemade spaetzle to use instead of store-bought egg noodles. I have since learned that his spaetzle recipe is really quite simple. It’s just eggs, flour and a few spices. These versatile and tasty little morsels can be used in so many ways too – not just for chicken soup. 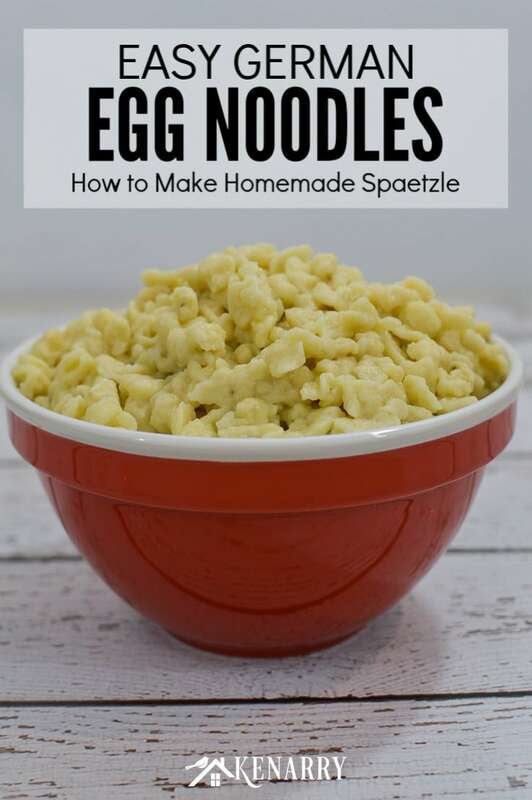 Today I’ll show you step-by-step just how simple it is to make spaetzle and then share a few easy dinner ideas for how to use them. Now before we go any further with this spaetzle recipe, you may be wondering what IS spaetzle? 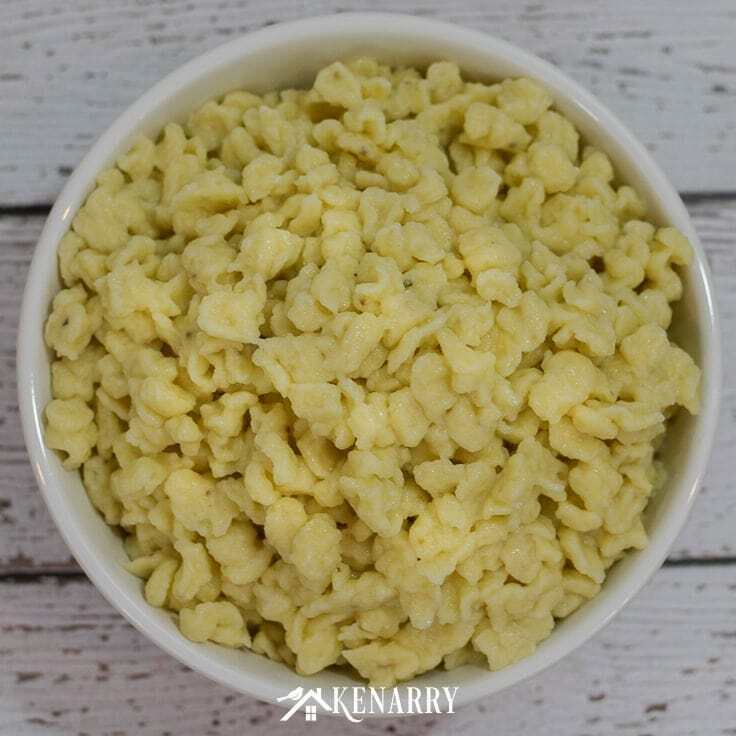 Spaetzle (pronounced SHPET-SLUH), also written as spätzle, is a side dish that originates from southern Germany and other parts of Europe. These small egg noodles or dumplings consist of small lumps or threads of dough made from flour, eggs and basic spices. A spaetzle recipe is typically made by pouring the dough through an inexpensive spaetzle maker, a coarse colander or a grater with extra wide holes into boiling water. After it’s been drained, people often mix spaetzle with butter, lightly pan-fry it, or use it in sauces, stews, etc. To make this homemade spaetzle recipe you just need a few simple ingredients. Most of these things are staple foods and common tools you probably already have on hand in your kitchen, except for the spaetzle maker. I highly recommend that you buy one online to make this spaetzle recipe as it is SO much easier. 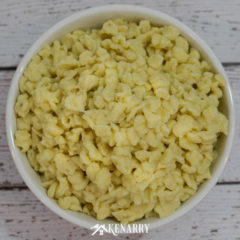 However I do list a few alternative options later in this post if you do not have a spaetzle maker. 1. Make the spaetzle batter. 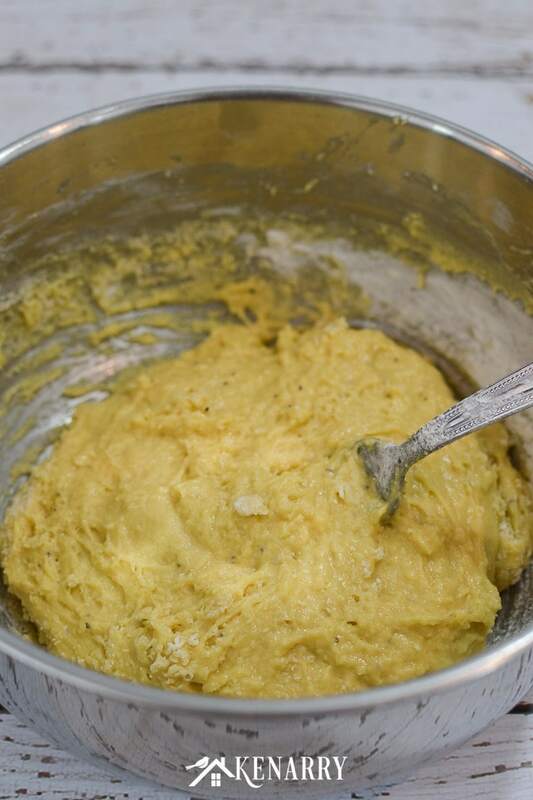 In a mixing bowl, whisk together the eggs, black pepper, salt and garlic powder. Slowly add the flour to the eggs a little at a time. Continue to add flour and stir until the batter is “thick like peanut butter” as my dad would say. The batter should be stiff and a little sticky, not drippy. 2. Pour the batter through a spaetzle maker into boiling water. Bring a large pot of water to boil on your stove top. Once the water is boiling, place the spaetzle maker on top of the pot. Next for this spaetzle recipe, you’ll pour about half to a third of the batter into the hopper of the spaetzle maker. If you don’t have a spaetzle maker, look around your kitchen for any tool with large holes that might work like a slotted spoon or a grater. I’ve provided additional suggestions later in this post. Now slide the hopper back and forth across the spaetzle maker so that the little dumplings start to form and drop into the pot of boiling water. Add more batter to the hopper as needed and continue until you’ve used all of the batter. Tip: As soon as you’re done with the spaetzle maker toss it in your sink with warm soapy water. This will make it much easier to clean later. Turn the heat under your pot down to medium. Then let the spaetzle cook for 10 minutes, stirring occasionally. When it’s done, drain it through a colander in your sink. 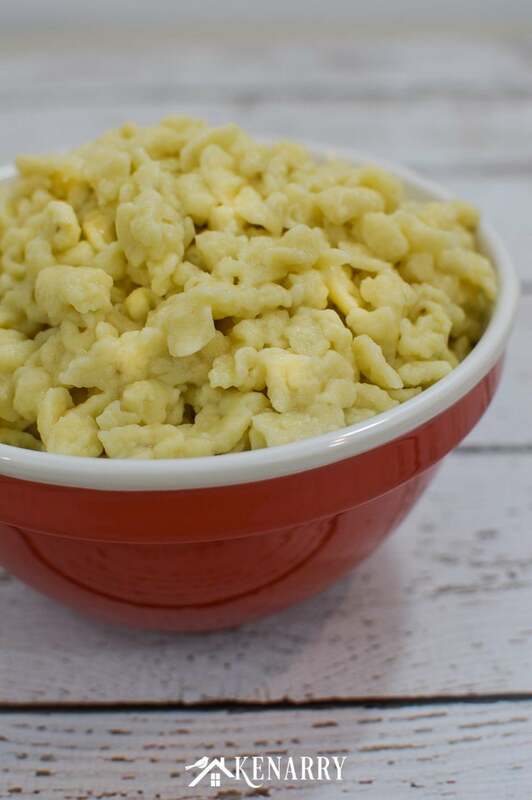 That’s all there is to making homemade spaetzle for you and your family! You can either serve the spaetzle immediately as is, saute it in a frying pan or add it to a soup, stew or whatever you’d like. I’ve listed several great suggestions below. 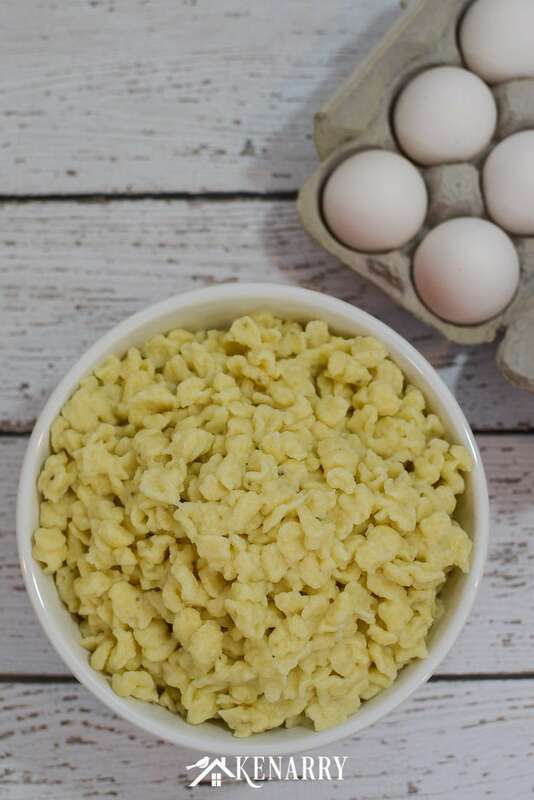 Learn how to make traditional Bavarian style German egg noodles with this easy spaetzle recipe. 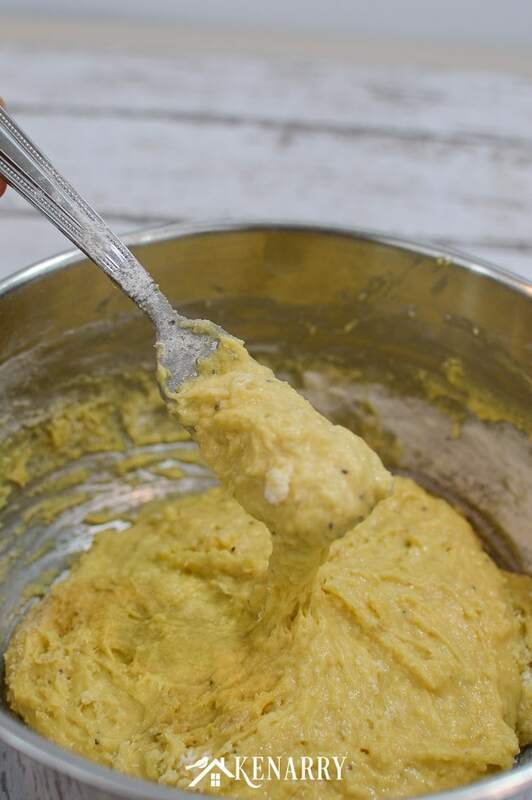 In a mixing bowl, whisk together eggs, pepper, salt and garlic powder. Add the flour to the eggs a little at a time until the batter becomes thick and sticky. Bring a large pot of water to boil on your stove top. 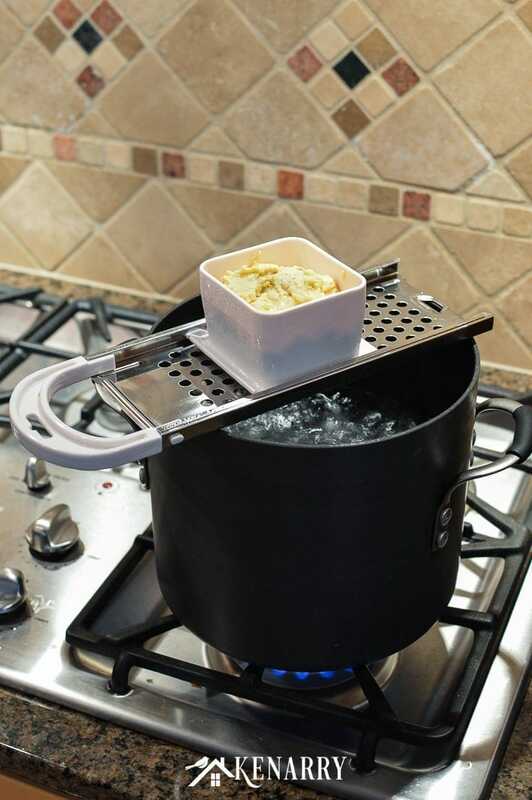 Put a spaetzle maker on top of the pot of boiling water. Pour the batter through the spaetzle maker into the boiling water, by sliding the hopper back and forth so that the little dumplings start to form and drop into the pot of boiling water. Turn the heat under the pot down to medium. Then let the spaetzle cook for 10 minutes, stirring occasionally. When it’s done, drain it through a colander in your sink. How to Make Spaetzle Without a Spaetzle Maker? When I first learned how to make spaetzle, my dad taught me to put the ball of dough on a large glass plate. Then you carefully and quickly cut small chunks of dough off the plate using a regular table knife and flick them into the boiling water. Use the edge of the glass plate to help you in the cutting process. This method results in much larger noodles than what you see pictured and may require a few extra minutes of cooking time. Alternately you could use a coarse colander with big holes. Put the spaetzle dough into the colander. Then stir with a spoon to gently push the dough through the holes. A third way is to use a grater with extra large holes. 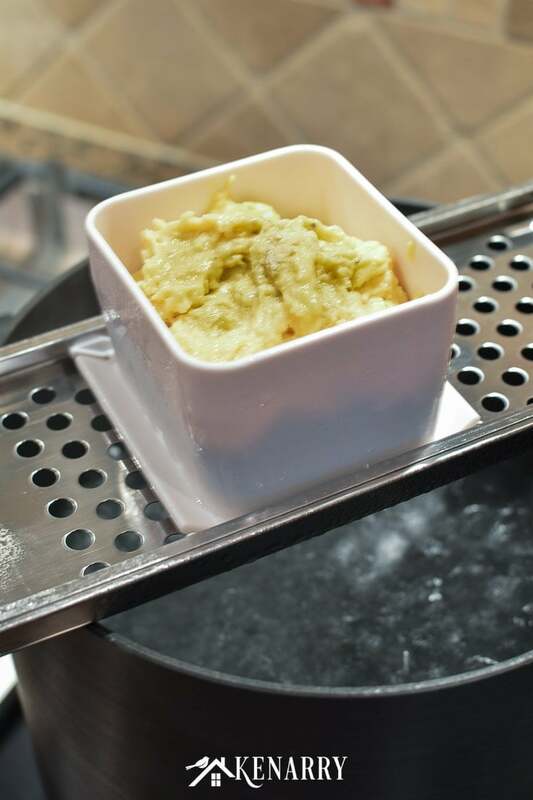 For this method, you would spoon spaetzle batter onto the grater a little at a time. Then rub a table knife, spatula or some other simple utensil back and forth over the holes to push the dough through the grater into the boiling water. Can Spaetzle Be Made Ahead of Time? Prepare just the spaetzle dough ahead of time. Then cover and keep it in the refrigerator until you’re ready to make fresh spaetzle at dinner time. You can make this entire spaetzle recipe a day in advance. Store the spaetzle covered in your refrigerator and then just heat the German dumplings at meal time or add them to whatever you’re making for dinner. Spaetzle is a great leftover! Just keep it in a microwave safe container in your fridge and you’re ready for an easy grab and go lunch. Layer spaetzle with shredded cheese in an oven safe baking dish to make a delightful, käsespaetzle (that’s German for cheese spaetzle). Use it to replace pasta or potatoes in any of your favorite soups and stews. Pour a thick beef or turkey gravy over top of the spaetzle, like you would with mashed potatoes. Mix it with browned sausage to make it a full meal rather than a side dish. This recipe for red pepper spaetzle in a mustard sauce with spiced sausage looks amazing. Let us know in the comments below what variations you make to this spaetzle recipe. 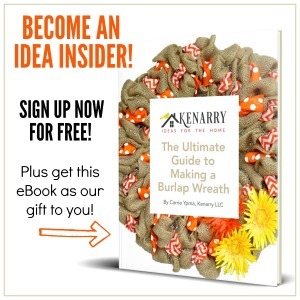 We’d love to hear from you and are always looking for new ideas.